Kim Bowman, born in Margaret River, WA, in 1957, was mostly educated in the Netherlands, where he started art school in Den Bosch at the age of 17. He made art installations and environments and exhibitions of large books and ‘experience machines’. His works have been purchased and commissioned by museums, private art collectors and the Dutch Government. A few immature compositions date from those years, and Bowman also played guitars and drums in several New Wave bands at the time. After graduating from art school, Bowman made some tape compositions in his own studio, using both electronic and concrete sounds as well as self-made percussion and string instruments. He also started studying cello and percussion. Bowman started composition studies at the Utrecht Conservatorium of Music in 1986 where he also worked in the electronic music studio. He continued his studies at the Rotterdam Conservatorium of Music, where he also added double bass and piano to his curriculum. He graduated in 1993. Bowman’s works have been performed throughout the world and commissioned and performed by major orchestras and ensembles, such as the Residentie Orchestra The Hague, Amsterdam Sinfonietta, Holland Sinfonia, the Sydney Symphony and the Meridian Arts Ensemble New York. Reinbert de Leeuw, David Porcelijn, Etienne Siebens, Lucas Vis and Jac van Steen, among others, have conducted his works. Since 2005, Kim Bowman has been living in Sydney. 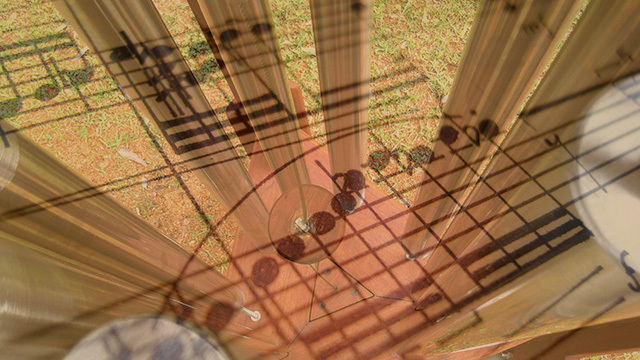 After working with landscape architect Fiona Robbé for some years, he started designing Sound Sculptures. From 2008 he has been designing a growing range of interactive and occasionally multifunctional Sound Sculptures for council and school playgrounds as well as Botanic Gardens and private gardens. wind chimes that were accelerated by huge wind fans on either side of the stage. Occasionally his works tend to incorporate other art disciplines, either by collaborating with other artists, or by including theatrical or visual elements. After a contemplative period of about five years, during which only a few works for mainly small ensembles were established, Bowman’s new challenge since 2010 is using visual and mathematical concepts to generate new works. For instance Particles for chamber orchestra, written early 2011, was initiated by quantum particle behaviour. Bowman is also increasingly challenging musicians to broaden their talents. As for instance in Syllables to Attitudes, a work for 2 female voices and large ensemble, written in 2012. In this work Bowman has broken down language in order to avoid meaning and narrative. The conductor plays a metal bucket with pebbles and claps his way on stage and in many ways musicians and singers are strained to go beyond the conventional performance of music by means of expressing themselves in theatrical ways. reading panel recommended Alchemia I for performance to the ABC orchestras, which led to the performance of the work in 2005 by the Sydney Symphony. Also in 1998, Entity for flute quartet received a honourable mention from the National Flute Association in the USA. In November 2005, Amsterdam Sinfonietta premiered Black Wind with percussion soloist Claire Edwardes and multimedia artist Susan Norrie in s-Hertogenbosch, Gent, Amsterdam, and subsequently at the 2006 Adelaide Festival. In the same year, The Violin was performed at the XXVIII Foro Internacional de Musica Nueva ‘Manuel Enriquez’ in Mexico City.